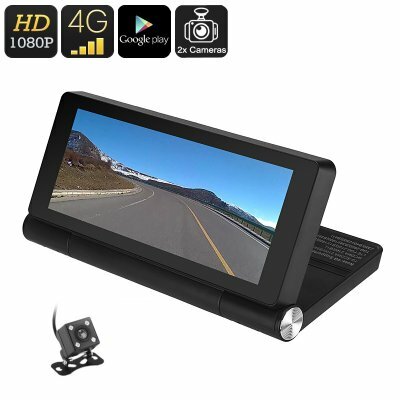 Successfully Added 1080p Car DVR - Android OS, 7-Inch Display, GPS, Rear View Parking Camera, Motion Detection, Google Play, Bluetooth, WiFi, 4G to your Shopping Cart. Keep track of all what’s happening around your vehicle with this Full-HD car DVR. Coming with a front and rear camera, this car DVR kit is sure to improve your safety on the road. The front dash cam has been built-in a crisp 7-Inch display on which you can enjoy real-time video. With a 1/4-Inch CMOS sensor in place, this front camera produces Full-HD footage at 1080p. With its 160-degree viewing angle, this dash camera records all that lies ahead. Naturally, the rear view parking camera can also be connected to the display. This provides you with a convenient way to see what’s happening behind your car and makes reverse parking a whole lot easier. Thanks to its Android operating system, this car DVR system is so much more than a regular dash cam. On its 7-Inch display, it lets you watch movies, play games, and enjoy Apps. With access to the Play Store, you’ll be able to install the latest media of your liking. Your Android media player even supports WiFi and 3G/4G input. This means that you’ll be able to browse the web wherever you are. With its Quad-Core processor, it lets you tackle all the basic Android features out there. Coming with App support, this car DVR system can be accessed remotely through your smartphone. This means that, even when you’re not around, you’ll be able to see what’s happening around your car. The dash camera comes with 16GB internal storage and a 32GB SD card slot. This provides you with all the storage needed to keep media and to record previous recordings. You’ll furthermore be treated to GPS to make sure you’ll never get lost again on your road to your upcoming destinations. With Bluetooth support, a microphone, and speaker – it even lets you engage in hands-free phone calls while cruising down the road. This 1080p car DVR comes with a 12 months warranty, brought to you by the leader in electronic devices as well as wholesale dash cams..